The Cobblers are on the brink of breaking yet another club record at Yeovil Town on Saturday. If Town avoid defeat at Huish Park then they will beat the record for unbeaten league matches, a record they currently share with Graham Carr’s division four title winning side of 1986/87. That record stands at 21 matches unbeaten, and if they manage to surpass that mark, it will be the fifth club record this team will have beaten this season. They have already set new records for successive wins (10), successive away wins (8), away matches without defeat (14) and away victories (13) in what has been a remarkable season. 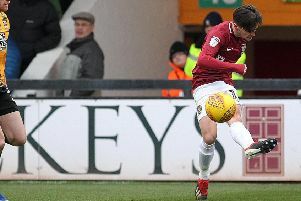 Wilder spoke earlier this week of smashing the unbeaten record, and also notching up 100 points which the Cobblers can do if they win their remaining three matches. But the Cobblers boss is now playing things down, saying that he just wants his team to keep on winning, and that any records that come along will be a bonus. “We just want to win the next game of football, that is all we want to do,” said the Town boss. “If the record comes along, like it did when we won the games on the spin, like it did when we have been unbeaten away from home, or whatever, they all come along if you win games of football. “We have seen records crash and if we win on Saturday then another one goes, but the focus from the group all along has been to win and be consistent. “Before the game against Crawley on Tuesday you just felt the boys were not prepared to take their foot off the accelerator. “I think if anybody did, I wouldn’t have liked to have been that player, because they would have had nine or 10 of their team-mates at them to make sure they were right. That’s a great quality to have in the group. “Records aren’t really talked about, and I don’t know exactly what I said because I have been under the influence quite a bit over the last couple of weeks! “But it’s not really about the 100 points, it’s about winning the next game. We can win, we have shown that all season, and we would love to win the remaining games.